2,2-Dimethoxypropane is used as a pharmaceutical and agrochemical intermediate. It can be applied as an additive in electrolyte for batteries. There are some useful 2,2-dimetoxypropane applications in analytical chemistry (GC-MS analysis) and biologic research (dehydrating agnet). It helps to quantify the absorbed water in coals (1H-NMR). 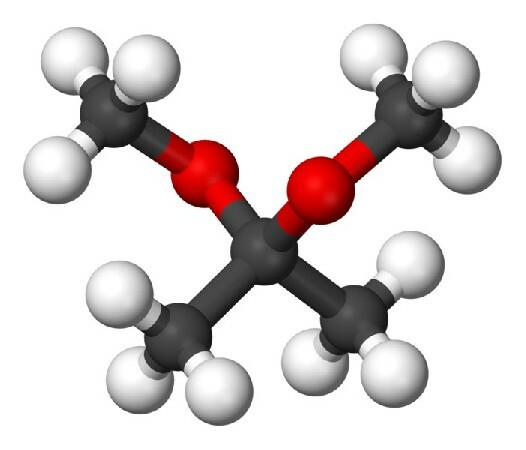 2,2-Dimethoxypropane (DMP) is a colorless transparent liquid with the smell of acetone. It is moderately soluble in water, soluble in benzene, carbon tetrachloride, ethyl ether, n-butane, methanol. The product is stable and reactive with oxidizing agents, acids. In histology, DMP is considered to be more efficient than ethanol for the dehydration of animal tissue. Acidified 2,2-dimethoxypropane (DMP) can be used as a dehydrating agent which causes rapid chemical dehydratation of biologic samples for scanning electron microscopy. 2,2-Dimethoxypropane is used as a pharmaceutical intermediate, including intermediates for synthesis of vitamin E, vitamin A and various carotenoids such as astaxanthin. DMP can be considered as a desirable additive in electrolyte for lithium-ion batteries operating at high temperature, ca. 60 °C. The results of studies reveal that the cyclic life test and storage performance at high temperature in electrolyte with DMP additive was better than that in an electrolyte without additive. 2,2-Dimethoxypropane is a value intermediate for the production of insecticides and fungicides. The well known reaction between 2,2-dimethoxypropane and water allows for the conversion of an aqueous into an organic solution ready to be injected directly into a gas chromatographic-mass spectrometric (GC-MS) system. This method is proposed for the GC-MS analysis of aqueous solutions containing hydrocarbons, halogenated hydrocarbons and ethers. Intermediate for the synthesis of 2-methoxypropene. Reagent for the preparation of 1,2-diols as acetonides. Use of 2,2-dimethoxypropane and 1H-NMR to distinguish and quantify the external and internal sorbed water in coals.